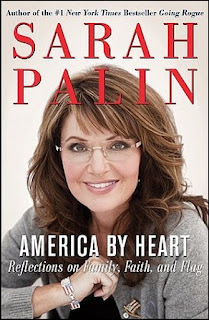 The Midnight Review: More Hypocrisies From Sarah Palin's "America By Heart"
More Hypocrisies From Sarah Palin's "America By Heart"
After reading some excerpts of Sarah Palin's newest book, "America By Heart," I found a couple more things that I thought were worth mentioning. Most of those who write for the mainstream media and teach at universities and law schools don't share the religious faith of their fellow Americans. They seem to regard people who believe in God and regularly attend their church or synagogue as alien beings, people who are "largely poor, uneducated and easy to command," as the Washington Post once famously put it." In the above passage, Palin is claiming that liberals don't have the same religious convictions as conservatives. She doesn't explicitly say "liberal" or "conservative," but considering her criticisms in the past of there being a liberal bias in America's media and schools, then it is pretty safe to see just what Palin is implying. Palin is guilty of what she accuses those liberals of doing. In her last sentence, she claims those on the left accuse those on the right of being easily manipulated because they have religion, but she seems to be attacking liberals for being manipulated for lacking religion. On movies, she criticized movies like American Beauty for glorifying drugs and apathy while praising movies like Juno. A European movie might have had Juno get her abortion in the opening scene and then spend the next hour and fifteen minutes smoking cigarettes and pondering the meaning of life. It would have been depressing and boring. Not here. Americans want to be entertained, but we also want to see people do the right thing, even when it's hard and there is no prospect of being rewarded. Hooray for some in Hollywood for occasionally letting us see that. Had I listened to those who suggested it would be political suicide to hand the Governor's reigns over to my lieutenant governor entering my lame duck last year in office -- a choice I made so that I could fight for Alaska, and America, more effectively in a different venue -- then my state would have suffered from the obstruction and paralysis of my office by the politically motivated attacks that began the day I was announced as the Republican vice-presidential candidate in 2008. Had I listened to the politicos (even some within my own political action committee) and shied away from endorsing candidates I knew were best for America -- people such as Susana Martinez, Nikki Haley, Doug Hoffman, Joe Miller and Karen Handel -- I wouldn't have been using my position in the best interests of the country I love. Again, Palin is doing what she criticized others of doing. 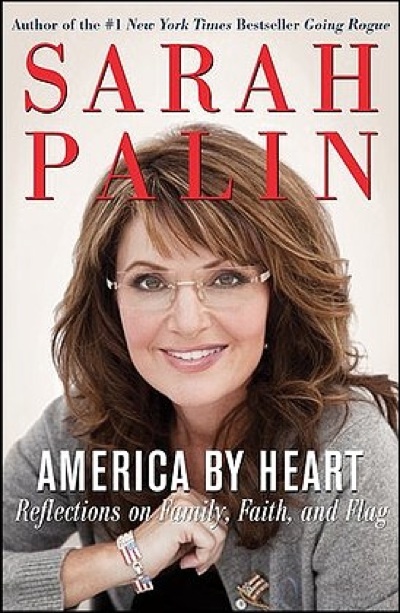 "There is a narcissism in our leaders in Washington today," Palin wrote earlier in her book. "There's a quasi-religious feeling to the message coming from them. They are trying to convince us that not only are they our saviors, but that we are our saviors... as candidate Obama proclaimed on Super Tuesday 2008, 'We are the ones we've been waiting for, we are the change that we seek.'" And don't forget Palin's attack on NASA while forgetting her personal hero, Ronald Reagan, did the same exact things. What about the claim that she was entering her "last year" of office? I thought she had longer to go in her term than 1 year? And the claim that she had to quit lest the office be paralyzed by "politically motivated attacks," I thought I read that at the time she quit, all of the investigations except one (the one she had started) were actually already done. Is that not the case? I was wondering that, too! I thought she had halfway to go - two years. But... if you consider everyone on the right claiming Barack Obama was a lame duck president not even halfway through his first term, maybe Palin thought the same about her own position! Kevin, this criticism of Palin might be misdirected. Assuming the manuscript is too big to have been written on her palm, she didn't write it. Speaking of abortion, you should mosey on over to the Biggovernment site. They had an article praising Barry Goldwater. I really spoiled their day when I pointed out he was pro-choice.